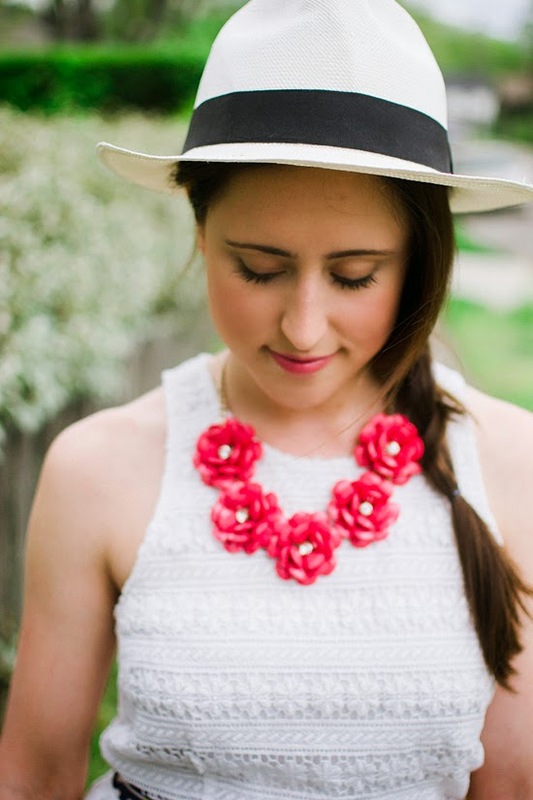 Here & Now | A Denver Style Blog: hello honeymoon! It was literally freezing last night in Nashville (might be the only time I've used that word properly), but I'm already dreaming of the beaches in Antigua! Hello Honeymoon! In fact, this entire outfit is already sitting in my luggage & has inspired the direction of my honeymoon attire. Because we are packing not only for a week in Antigua, but also a night in NYC + a week in Oregon, I need to figure out a way to pack minimal items with maximal outfit potential. The other way I'm packing light (light-er maybe, let's be real, I pack a LOT-o-stuff) is considering remix potential of each item. This dress + purse + shoes would be great for a beachside lunch at one of our resort's amazing looking restaurants (I might already have my meals planned out for the week too!). But I plan on wearing this purse in its cross body style (seen in Monday's post) with a maxi dress for a day of shopping in town. 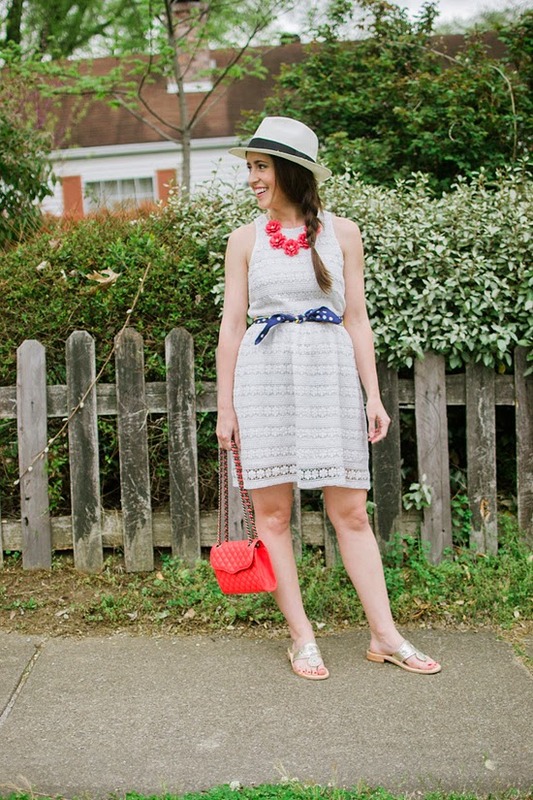 And will snazzy up this beautiful white crochet dress with wedges for our backyard Oregon reception. I love a scarf that functions as a belt, head scarf & sun protector + these classic Jack Rogers sandals go with everything (wanted to put literally in front of that, but refrained)! Have you ever packed for 2 weeks… where do you even start? 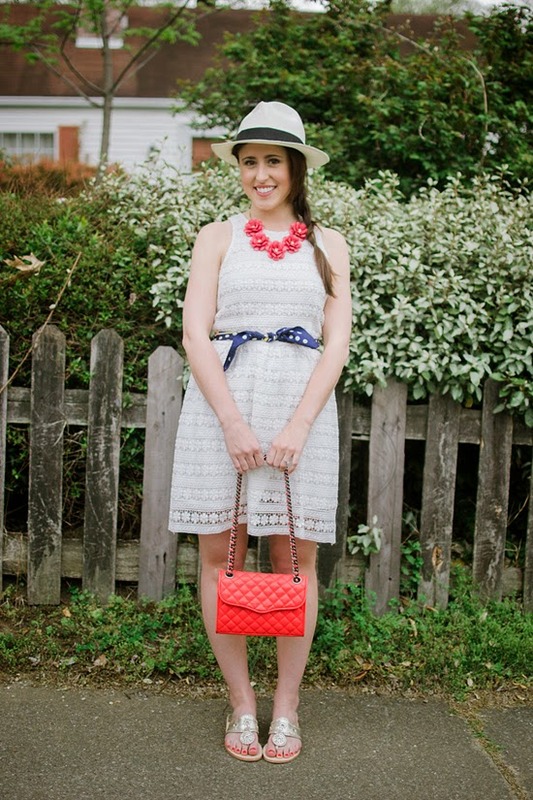 Any one else looking forward to leaning heavily on their LWD (little white dress) this Spring & Summer? Zappos provided me with items in today's post, but all reviews & opinions are my own! i LOVE that dress on you!! That dress looks so good on you Jessica! I love how you've used a scarf as a belt!! Such a cute outfit!! Hope you have a great wedding and honeymoon!!! Such a great vacation look! 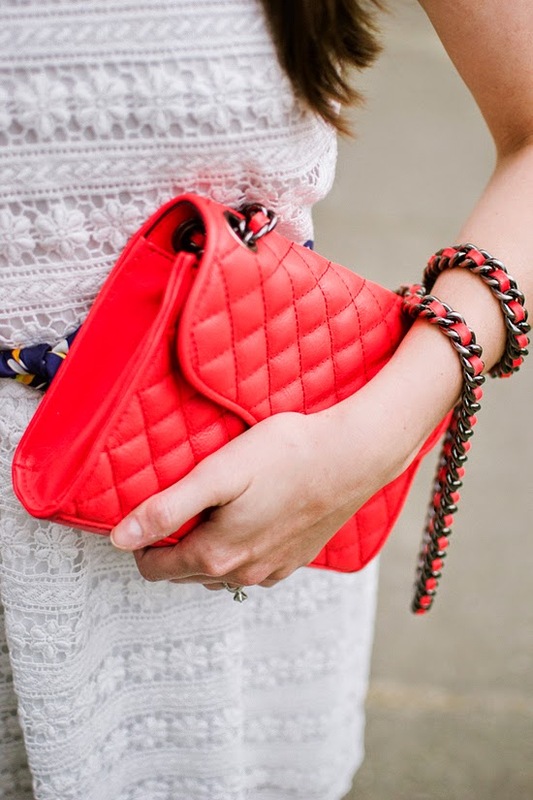 I am loving the coral accessories in this look! this is a fabulous outfit! jealous of your honeymoon vacay! love the colours in the outfit, and that necklace. cute! Yes yes yes! 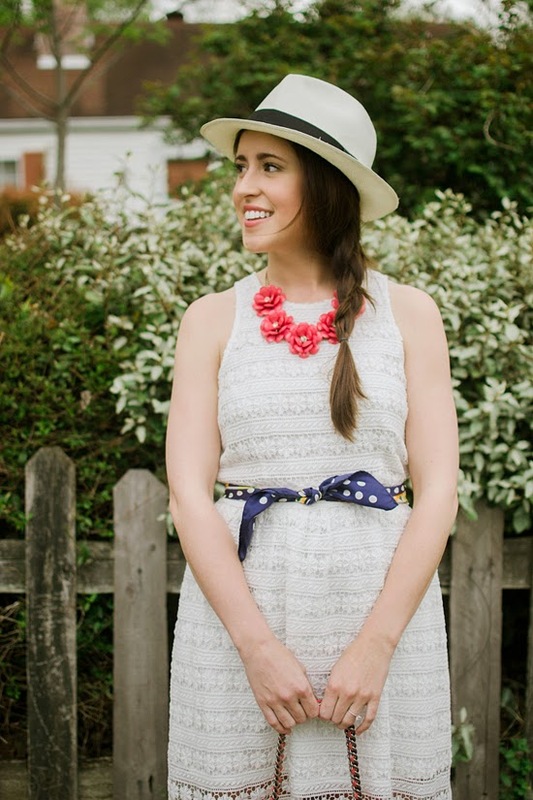 I am in love with little white dresses for spring and summer! And that is so exciting that your wedding and honeymoon are coming up in less than three weeks!!! ah this is really cute! Really cute outfit! I packed for 2 weeks last summer in just carry on luggage. We did Seattle, Vancouver, an Alaskan cruise, and hiking in Denali. It was a tight squeeze, but I just planned all of my outfits ahead of time, wrote down the combinations, and didn't pack a single thing that couldn't be worn at least twice. That was tough with everything from formal cruise dinners to dog sledding! Limiting your color palette is also definitely the way to go! Such a great look! Hope you have a fab honeymoon! Yes, I travel for work all the time so I'm a master at packing light :) Sticking to a color palette is crucial, as is packing a few pairs of pants and more top options. You can re-wear jeans/shorts and make a million combos if you have enough tops to go with it (plus light breezy tanks/tees take less space). Wear your heaviest shoes and one light coat (trench, military jacket, etc) to the airport to save on space... and also because planes tend to be cold. My husband and I packed for a 2 week honeymoon trip in a small carry-on each, so it can be done! SOOO exciting you are SO close!! love that dress! The close up pictures are always the prettiest of you - that face! How excited are you for your wedding?! I can't wait to see all of the pictures and hear all about it. BTW, lucky lady working with Zappos! Both that dress and purse will last you so long. Such a cute dress. I love how you are plan everything out ahead of time. Wow the wedding is soo close :) And it will be so nice to be on a nice hott beach! This dress looks ahmazing--love the accesories you paired with it. Oh this is such a cute look! Absolutely perfect for your honeymoon! So exciting!!! that scarf is perfection! i've been wearing them in my hair a ton, but i hadn't thought of wearing longer ones belted on a dress! I am going to do my best to show a collage of what I pack & then pictures of the resulting outfits! Oh girl, that sounds rough! Hoping you get some time to relax after the big test! Oh no worries, I shared a little bit about it when we first got engaged (last March), but have kept most of the wedding stuff off of my blog/social media… but just you wait till after the wedding, let the over-sharing begin! Ooh girl, that wins some type of packing award! I think the key is not only planning in outfits, but also writing said outfits down… nothing like getting to your destination & forgetting all your great ideas! I'm really excited about sticking with the limited color palette, & thanks for the tips about more pants than shirts! So key! Haha oh yea! We will definitely be hitting up that area again - so fun! How cute are you?? This outfit it absolutely adorable. I love it! Definitely honeymoon perfect! And it sounds like you will have an amazing honeymoon! Thank you so much! We are just so excited to start this new chapter of our lives together, I will be sharing more wedding posts this Summer for sure! My problem is throwing things in at the end… hoping I can overcome that this time! Such a cute outfit for the honeymoon!! I can't wait for mine either! :)) Yay for beach honeymoons! This is such a fun outfit! 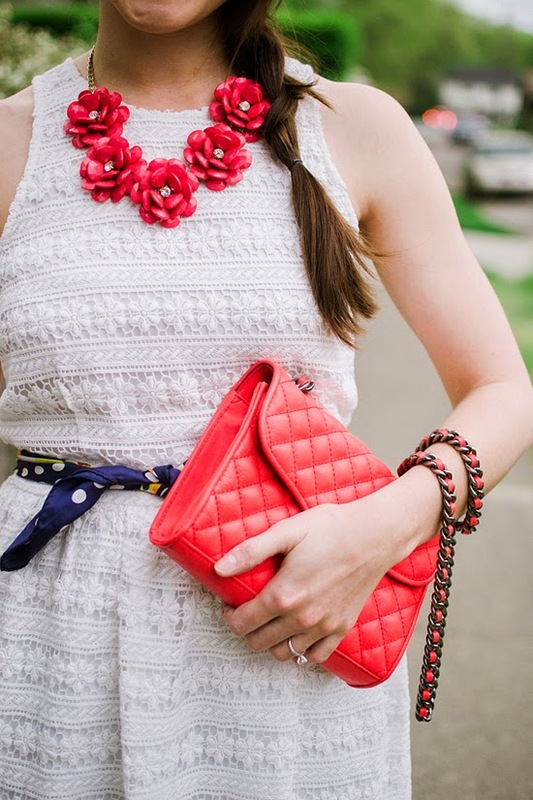 I love how the bright accessories pop against the white dress! love this!! that scarf as a belt is so cute! Love how you used the scarf as a belt. I would never have thought of that! 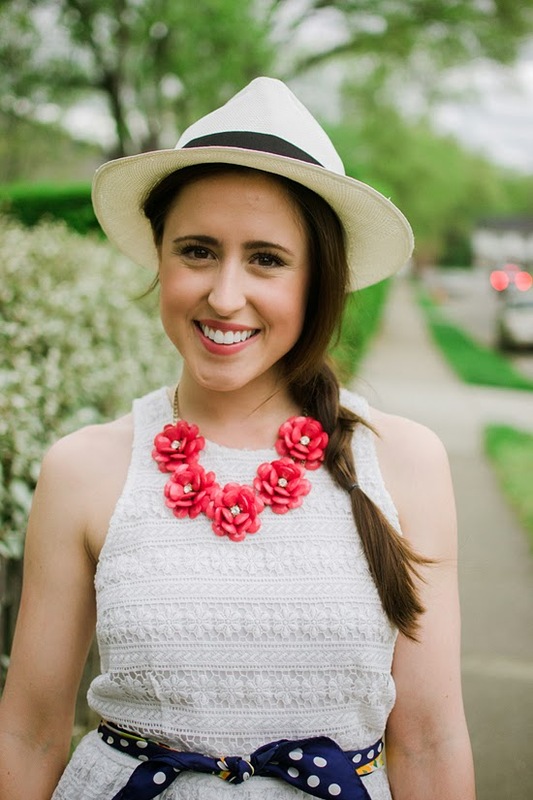 I love the side braid with that hat. Such a cute detail. That dress will give you so many options! Cute dress, and love the necklace and purse! Cute outfit! Love the scarf belt.